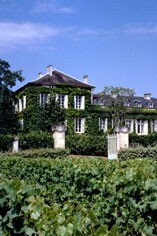 Château Talbot is one of the best-known Bordeaux wine estates to a UK audience, not surprisingly because it takes its name from John Talbot, Earl of Shrewsbury, who in 1453 suffered the ignominy of losing the battle, and with it his life, which allowed Bordeaux and its vineyards to slip back into French control after belonging to the British Crown for over 340 years. In the last century it has been owned by the Cordier family, and the red wine of the estate has long enjoyed a reputation for solid dependability. It is one of the largest estates in the Médoc and its 102 hectare single vineyard is situated inland from the Gironde River and west of the hamlet of St-Julien-Beychevelle. Georges Cordier, who owned the property in the mid-20th century, was a great lover of white wine, and, determined to produce his own, took the highly unusual step of planting 5 hectares of Sauvignon Blanc and Semillon in his vineyard, producing his first crop of white wine in 1945 (Le Caillou Blanc de Ch Talbot). The aim is to make wine in a Burgundian style, aged in oak barrels, with the 80% Sauvignon Blanc imparting vivacity and acidity, while the 20% Semillon imbues the wine with weight, backbone and ageing potential. Red wine from Talbot is typically a blend of Cabernet Sauvignon (66%), Merlot (26%), Cabernet Franc (3%), and Petit Verdot (5%) - the vinification includes 18 months maturation in small oak barriques (50% new). Talbot has a reputation for consistency and is one of the most carefully made and reliable of the St-Julien Cru Classé clarets. The best examples are richly aromatic with a bouquet of cedarwood and vanilla scented cassis fruits and with a palate packed with well-delineated, ripe, black fruits and finely integrated tannins. It is classified as a 4ème Cru Classé. A very solid performer both in terms of quality and pricing. It is very difficult to find any cheap back vintage of Ch. Talbot and when we do it is always at a higher price that release. The 2014 made under the watchful eyes of the famous consultant Stephane Derenoncourt is a stunner. Blackcurrant and cherries on the nose with a touch of cedar, one of the most focused and fresh wine of the appellation, lovely concentration and depth on the palate, bags of black fruits in the middle and and excellent finish with firm but ripe tannins. Serious and structured it will provide customers with generous fresh early drinking while having all the ingredients for long term cellaring. Definitely one to watch. Max Lalondrelle, Fine Wine Buying Director/Bordeaux Buyer A very solid performer both in terms of quality and pricing. It is very difficult to find any cheap back vintages of Ch. Talbot and when we do it is always at a higher price than at release. The 2014 was made under the watchful eyes of the famous consultant Stephane Derenoncourt and it is a stunner. Blackcurrant and cherries on the nose with a touch of cedar, one of the most focused and fresh wines of the appellation, lovely concentration and depth on the palate, bags of black fruits in the middle and and an excellent finish with firm but ripe tannins. Serious and structured, it will provide customers with generous fresh early drinking while having all the ingredients for long term cellaring. Definitely one to watch. The easy-going charm of 2014 as a vintage suits Talbot’s cheerful character well. Displaying a plethora of ripe, plump dark fruits with a depth of flavour this is going to delight followers of this perennially popular château. Full-bodied aroma with cassis and red plum to the fore. Plenty of weight and depth of fruit on the palate, with good intensity. Plentiful tannins but well-coated by the ripeness of the fruit. As usual with Talbot, a solid, reliable wine but with an added dimension of finesse this year. Wonderfully aromatic, Ch. 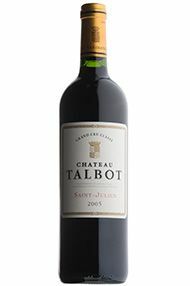 Talbot’s 2009 is a concentrated wine which brims with pure, ripe blackberry fruit. There is so much fruit in fact that the fine, powdery tannins feel almost hidden as they glide smoothly across the palate. Make no mistake though - they are there, and herald a long and promising life for this elegant yet mellow wine. Stéphane Derenoncourt has done it yet again with this fantastic showing from Ch. Talbot. We get all the classic sophistication of St Julien combined with real concentration and impressive depths. The palate is full to bursting with dark berry fruits but they are hidden, waiting to evolve and unfurl from beneath a thick dark chocolate heart imprinted with smoked earth touches. This dense Ch. Talbot has plenty of weight with a rich and satisfying finish. Lots to offer from this popular and great value chateau. A Quatrième Cru Classé, Ch. Talbot has a reputation for consistency, as one of the most carefully made and reliable of the St Julien Cru Classé Clarets. The best examples are richly aromatic with a bouquet of cedar wood and vanilla-scented cassis fruit, with a palate packed with well-delineated, ripe, black fruits and finely integrated tannins. This is very hedonistic, with bags of lush, upfront fruit and easy charm. An attractive, perfumed nose is followed by a silky, textured palate, with good tannins and concentration. It is utterly delicious but is very atypical St Julien – if anything it is more reminiscent of a Pomerol! A real vin de plaisir and the best Talbot we can remember. The 2010 Ch. Talbot is a favourite with many, and with good reason. Don't expect huge detail and complexity, but what it does provide is great focus, a depth of crunchy bright fruit which builds on the palate and serious structure. This is a very generous wine with superb length on a fresh and uplifting finish, perhaps the best since the great 1986?